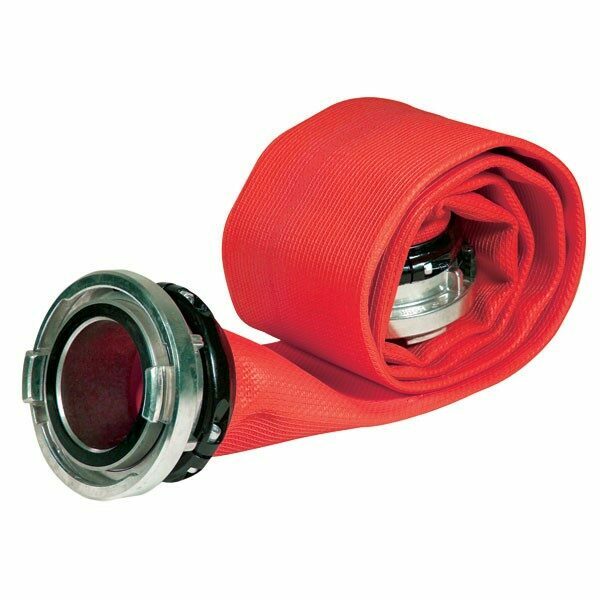 Large Diameter Rubber Covered Supply Hose - SOS Safety Int. 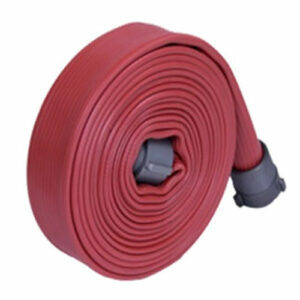 Inc.
A lightweight, heat resistant, large diameter supply hose that delivers superior flow during fireground operations. Ozone and chemical resistant, the nitrile/PVC throughthe-weave design allows the hose to expand under pressure — decreasing friction loss and increasing water flow. The thin rib rubber outer cover offers increased resistance to impact, punctures and abrasion. 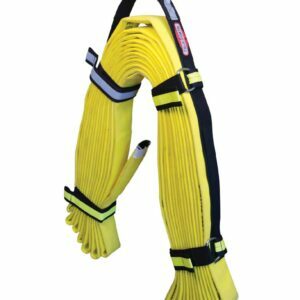 Reliable, maintenance-free and requires no drying, make this the ideal supply hose for municipal and industrial fire departments. NFPA compliant and UL listed. Hose shall withstand 10,000 cycles on the Taber Abrasion Machine (H-22 Wheel: 0.5 kg), without exposing the liner. Key Hose, on request, will supply written warranties that Pro-Flow hose meets a minimum 10,000 cycles. Other abrasion test results (UL, DIN, etc.) can be supplied on request of purchaser. Hose shall have a capability of use down to -35 °F. Hose shall have no apparent damage to cover, reinforcement or lining when subjected to the following cold flexibility test: a 50′ length of dry hose is to be firmly coiled and placed in a cold box at -35 °F for a duration of 24 hours. Immediately after removal of the hose from the box, hose should be uncoiled and laid out by one operator. 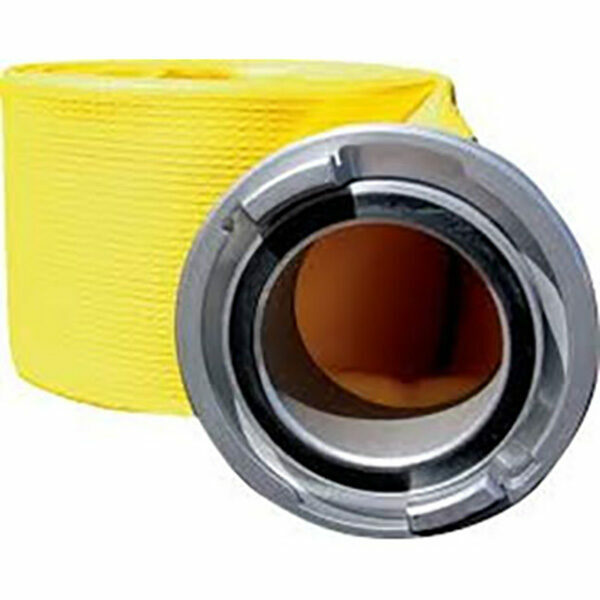 Hose shall show no visible signs of cracking to the lining or cover when tested in accordance to ASTM D518 Procedure B (100 pphm / 118 °F / 70 hours). Exposure to sea water and contamination by most chemical substances, hydrocarbons, oils, alkalis, acids and greases must have no effect on the short or long term performance of the hose. A chemical resistance chart is available and Key Hose will supply specific chemical resistance data on request of purchaser for unique applications. The hose, when subjected to a static pressure of 100 psi, shall be capable of withstanding a surface temperature of 1200 °F for a minimum of one minute without rupture or damage to the synthetic reinforcement. As required by purchaser, expansion ring threaded, Storz clamp ring, etc. Hose shall be made from 100% high tenacity synthetic polyester yarn, circularly woven and completely protected by a through-the-weave extruded PVC/Nitrile rubber, forming a single homogeneous construction without the use of glues or adhesives of any type. Pro-Flow features a thin rib construction to aid abrasion resistance. 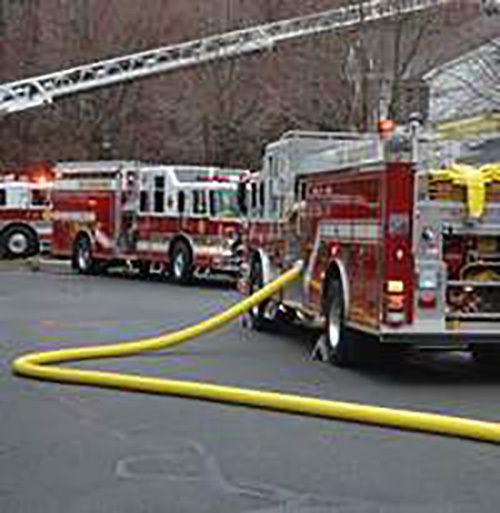 Pro-Flow meets or exceeds requirements of NFPA 1961. Pro-Flow shall carry a 10-year written warranty against defects in materials and workmanship. Lengths available up to 100′. Ultimate Tensile Strength – Tensile strength of the lining and cover shall not be less than 1200 psi. Ultimate Elongation – 400% minimum. Accelerated Aging Test – The tensile strength and ultimate elongation of the vulcanized rubber compound which has been subjected to the action of oxygen at a pressure of 300 psi (±10 psi) and a temperature of 158 °F (±18 °F) for a period of 96 hours shall retain 60% of its originally stated properties.